Remarkably, these strikes have garnered overwhelming support from the public, despite years of well-funded attacks on teachers unions. In a recent NPR/Ipsos poll, just one in four respondents said they think teachers are paid enough, and three-quarters said teachers have the right to strike. Remarkably, this support cut across party lines. “Two thirds of Republicans, three-quarters of independents and nearly 9 in 10 Democrats” support the teachers’ right to strike, the poll showed. The most recent walkouts have shifted to western states. 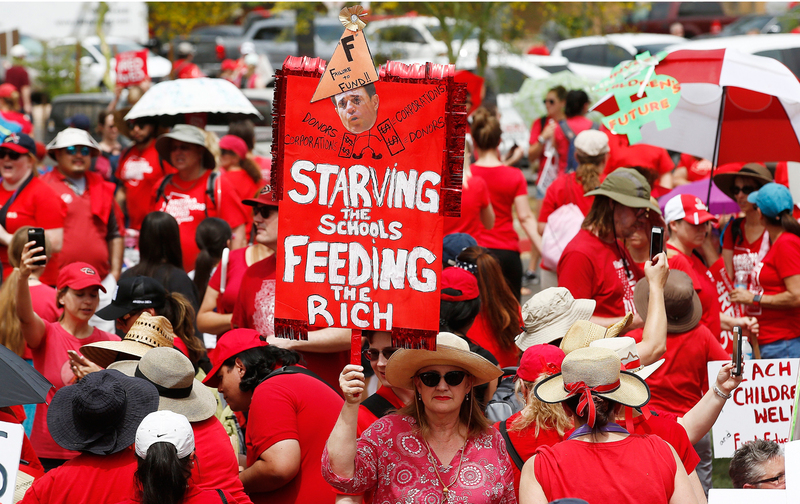 On April 26, 50,000 teachers and their supporters march through Phoenix in 100 degree heat. That same day, thousands of protesters descended on the capitol of Colorado. Every walkout has resulted in victories, some more than others. In Kentucky, educators forced the governor’s veto of new taxes to be overturned, providing some additional funds for schools. But they fell short of preventing the conservative legislature from weakening their pension plan. In Oklahoma, while educators failed to stop a raft of tax cuts and increase overall funding, they still won their first raise since 2007 by $6,000 a year, which by is huge by local standards. In Arizona, the teachers won a 9 percent immediate raise, with Governor Doug Ducey pledging 11 percent more to achieve what he calls the 2020 deal, a 20 percent pay raise for all teachers by 2020. Governor John Hickenlooper, the only Democrat to head one of these states, responded to thousands of protesters by committing to restore $1 billion in education funding. In West Virginia, the strike settlement included the creation of a task force to come up with a long-term solution to rapidly rising health-insurance costs facing not just teachers but all state workers. The Public Employees Insurance Agency Task Force (PEIA), which includes representatives from all three education unions, was created in the heat of the strike by an executive order from the governor. But once the media turned their attention away, Governor Jim Justice tried to undo the part of the order that mandated 55 public hearings in all 55 counties. “To us, the hearings were a key part of the executive order because it gives our community the right to be heard in designing the largest healthcare plan in our state,” Comer says. “We immediately started an action plan, generating 350 letters in a week, demanding they restore the public-hearing process. We wound up winning back what will be a total of 21 public hearings across the state. 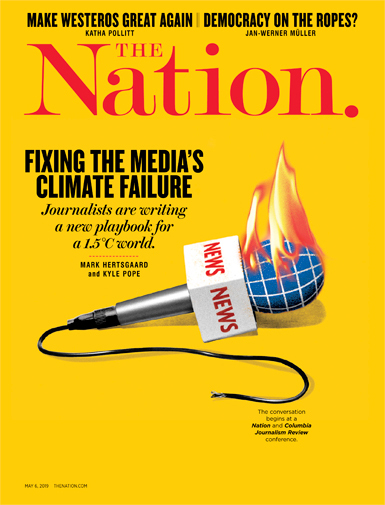 That was definitely a win.” Perhaps more importantly from an organizing perspective, the task force puts into place a mechanism to continue building power on a key issue, while also allowing educators to get back to work educating. Such blue-state activism (and intra-Democratic Party feuding) was presaged by Massachusetts in 2016, when the Massachusetts Teachers Association (MTA) defeated a ballot measure that would have greatly expanded charter schools. A whopping $35 million in favor of the measure poured in from hedge funds and private-equity groups. But in the end, the teachers—who took a gamble by not coming to a legislative compromise that would have stopped the ballot in exchange for less charter expansion—defeated the measure by an almost 2-to-1 margin. To continue this spring’s momentum, and increase turnout for the midterm elections, two things are urgently needed. First, national and state-level teacher union officials must embrace this rank-and-file movement. There’s no way better way to build the kind of workplace organization needed to stave off the coming blow from the Supreme Court in the Janus case than supporting this robust movement from below. This will necessarily include breaks with Democrats who have been virtually as complicit in the charter-school movement as DeVos and the Koch brothers.